Hello Nashville! 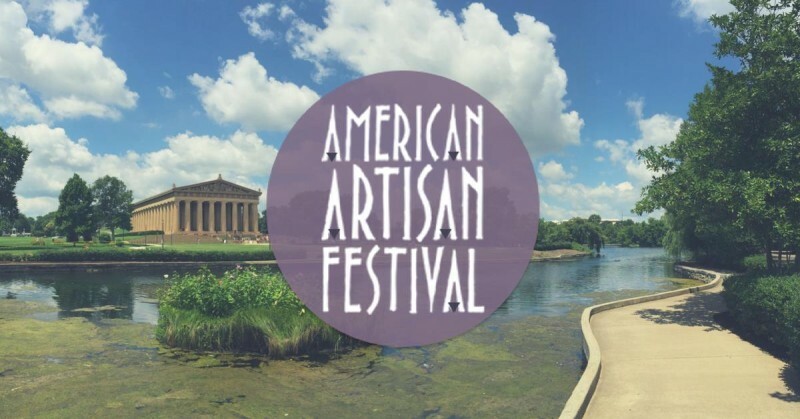 American Artisan Festival is this weekend! Hello Nashville! We can’t wait to see you and your lovely city again! We are thrilled to be participating in the revival of the historic American Artisan Festival in Nashville, TN this weekend, Friday – Saturday June 16 – 18. This show of American fine hand craft showcases 150 artists from over 35 states and it truly a one of a kind show. Come say hi and see us at Booth 86, near the corner of 27th & West End Ave.
American Artisan Festival has been a fixture in Nashville for over 40 years and is part of the fabric of the city and the annual arts calendar. The show has always been able to draw high-end customers by being the highest quality art show in the city. Presenting the highest quality contemporary craft and fine art, the 43rd Annual American Artisan Festival returns to the front lawn of Centennial Park. LOCATION: The Cockrill Springs section of Centennial Park. The show will fan out around the front lawn and scallop around the perimeter with the music stage, food, beer, and sweet treats set up under the magnolia trees in the center of the park. ARTIST EXHIBITORS: There will be 150 fine art and contemporary craft artists from around the country representing the highest quality work including painting, photography, mixed media, garden sculpture, ceramics, glass, wood, furniture, metal, jewelry, wearables and so much more. FOOD & BEVERAGE: We are developing our own special artisanal food partnership with local food purveyors which will will highlight the best in local cuisine, local beer and our own curated mix of wine and craft cocktails. FREE KIDS ART ACTIVITIES: On the hill under the shade of the trees, we plan to have Parnassus’s Pegasus team hosting story and craft hours, The Clay Lady will be working with kids on ceramic creations, and Watkins College Community Arts Program creating crafts with kids of all ages. We will also have a few misting tents to make sure all the kids are cool and happy as well. LIVE MUSIC ALL WEEKEND: We will be producing a three-day musical lineup that features the best in Nashville singer songwriters as well as Americana, Blues, Gospel and more. PUBLIC ART INSTALLATION – GROW LOVE: We will be bringing a first-ever site-specific community based public art project to the great lawn in front of the Parthenon which is entitled GROW LOVE. As a physical bridge between the Parthenon and the Festival, it is intended to be a celebration of the rebuild of the festival and the park, as well as an homage to its founder Nancy Saturn. The work, created by Tracy Ginsberg and Theodore Lillie of Forest Alchemy, will be a 80 foot labyrinth designed in the shape of a Magnolia flower which visitors can physically walk through and leave a written message inside. The installation will show us a new way to experience the park, the Parthenon and the Festival. The installation is hosted in partnership with Metro Parks as well as through a THRIVE grant given to the artists by the Metro Arts Commission of Nashville. 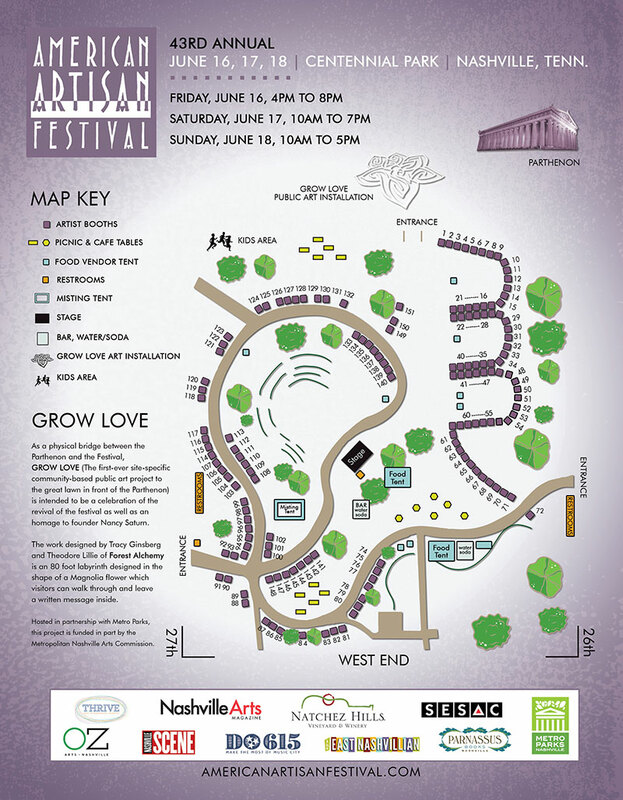 American Artisan Festival has been a fixture in Nashville for over 40 years and is part of the fabric of the city and the annual arts calendar. The show has always been able to draw high-end customers by being the highest quality art show in the city. The schedule of events each day can be found right here. 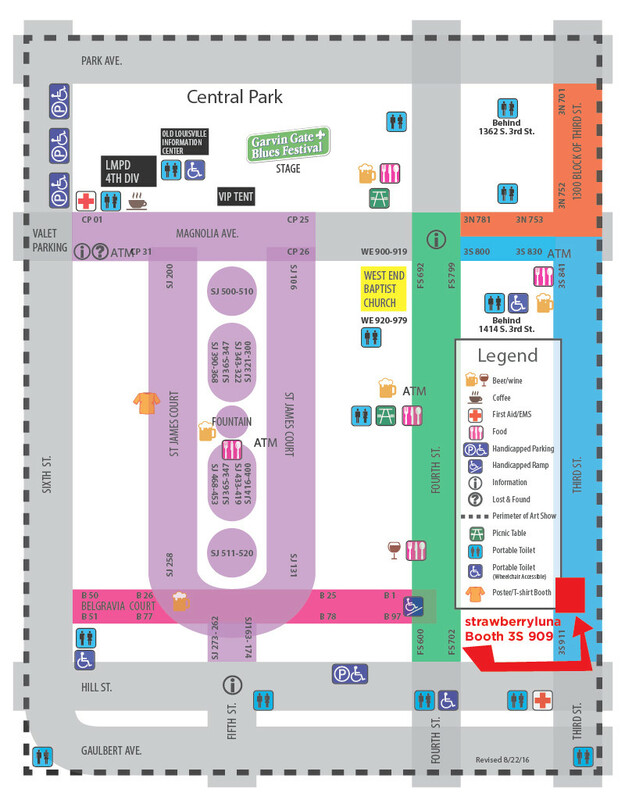 Here is the Festival Map below, click on the image to see a larger version. 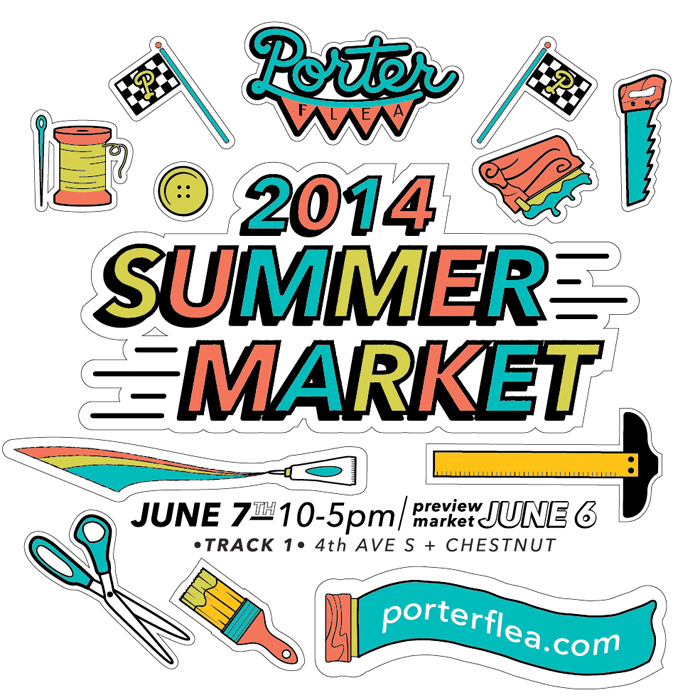 We will be Booth 86 near the corner of 27th & West End Ave., see you there, rain or shine! Hello Louisville & St. James Court Art Show! Well hello hello Louisville! We are awfully excited to get to know you this weekend at the historic, 60th Annual St. James Court Art Show! This is our 1st participation in this amazing show, so come find us and say hello at Booth 909, South 3rd Street Section (3S). We’ll have our Art Prints, Rock Posters, Lunch Bags, Alphabet Nursery Prints and one-of-a-kind Test Prints along. The St. James Court Art Show is a juried fine arts and fine crafts show that hosts an impressive 750 artists from North America. Held in the heart of historic Old Louisville among the country’s largest collection of Victorian homes, the St. James Court Art Show® has for over five decades provided our neighborhood, city and state with a rich cultural and artistic legacy. A huge event for the Louisville area, St. James Court Art Show is FREE and open to the public. There is parking in the area (check here for more info), and there are 2 Shuttle Services to choose from. Parking Shuttle Service directions 2016. What: St. James Court Art Show, now in its 60th consecutive year with over 750 participating artists from around the country. Where: Old Historic Louisville, KY – For GPS location use this address: 1402 St James Court, Louisville, KY 40208. For more info click here. Below is a Map of the show for you, so come on out! Handmade Arcade Hooray! This Saturday 12/8 – One Day Only! The Holidays are here in full effect and so is the amazing Handmade Arcade here in our hometown of Pittsburgh! Handmade Arcade is our last craft show of the year, and we couldn’t be happier closing out our schedule right here at home. Come join us and over 150+ vendors from all over the country with some of the nation’s best indie artists and crafters selling amazing handmade works for your holiday shopping lists – and don’t forget to pick up something for yourself too. You deserve it! We’ll be at Booth #154 and we will have lots and lots of our Art Prints, Alphabet Prints, Rock Posters, Lunch Bags, Hand Screen Printed Wine Gift Bags, Wood Art Pieces (super new from our gallery show at Wildcard!) and Test Prints plus more goodies! 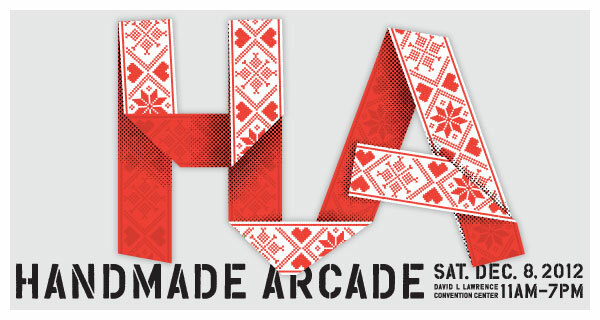 Handmade Arcade is Pittsburgh’s first and largest independent art & craft fair and is now in it’s 9th year. Handmade Arcade is FREE to attend and will be at the David L. Lawrence Convention Center Downtown with tons of cool & creative activities for children and adults alike in the Hands-On Handmade section all day too. The free Holley Trolley that runs in Downtown Pittsburgh will be making regular stops all day at the Convention Center for Handmade Arcade, and free parking will be provided by most garages (Convention Center garage excluded) and free on-street parking as well. So don’t miss out on the biggest Holiday Show in Pittsburgh and get your Handmade Holidays on with us. See you there! 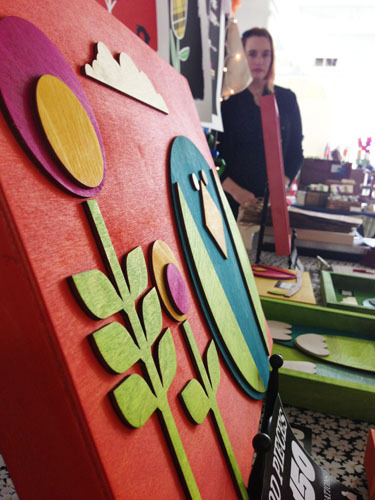 What: Handmade Arcade is Pittsburgh largest independent handmade art & craft show. Where: The David L. Lawrence Convention Center, Downtown Pittsburgh. When: Saturday December 8th, 2012 – ONE DAY only from 11am – 7pm. FREE to attend! “Elephants In The Trees” – Our Test Print Gallery Show At Rotofugi! We have some exciting news on the fine art front that we’ve been dying to share for over a year. And now the time has come! The fantastic Rotofugi Gallery in Chicago, IL is home to our new Gallery show of 16 hand silkscreened Test Prints / Monoprints as well as a brand new black & white silkscreen, monochromatic, oversized, 2-art-print-set. 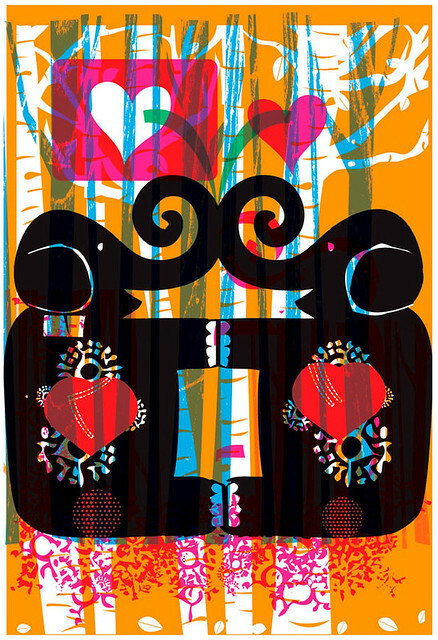 Our show, “Elephants In The Trees”, opens on Friday January 13, 2012. But don’t be scared, Friday the 13th is always a lucky day for Allison, she was born on one. We’re absolutely thrilled, nervous, and excited all at once. Allison is almost always working on a tall stack of silkscreen Test Prints in the studio with each new print run. However, they rarely see the light of day publicly. Especially over the past year while she has been working on a suite of individual prints for this Gallery show in particular. And this is a first, with the debut not only of most of these absolutely one-of-a-kind monoprints but also of a new oversized 2-print set, (expertly printed by our friends at Delicious Design League). All prints on display will be for sale exclusively through the Rotofugi Gallery, both in person and online. And here’s the thing, we can’t show you much before the Opening on Friday January 13th, 2012 BUT! You can totally sign up for the Rotofugi Gallery’s preview email list RIGHT HERE and get a beautiful eyeful of this (and any upcoming shows) special private preview and see the artwork for yourself before the general public. Trust us, this makes trying to buy original art and one-of-a-kind pieces far easier. ‘Cause once they are sold ‘cuz, they’re gone forevers. Until then, here’s a little sneak-peek teaser of just a few of our 16 silkscreen printed, individual, one-of-a-kind Test Prints in the our upcoming show. We hope to see you there on Friday, January the 13th at the opening reception! 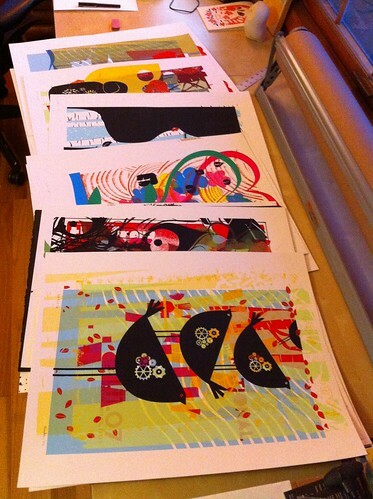 Sneak-peek at just a few of our Monoprints to be shown at Rotofugi. Click for more info about this ONE NIGHT ONLY (!) art show. Hey gang! We’re in a very unique and fun gallery show that’s a ONE NIGHT ONLY gig at the iconic and very rad UNSMOKE Art Space in Braddock, PA. Yep! Pretty special. Ever wonder what that area that you see while screaming your head off on The Phantom’s Revenge at Kennywood is? BOOM. It’s Braddock. We’ll be showing art prints and brand new, one of a kind Monoprints / Test Prints, all of which making their debut at the show. 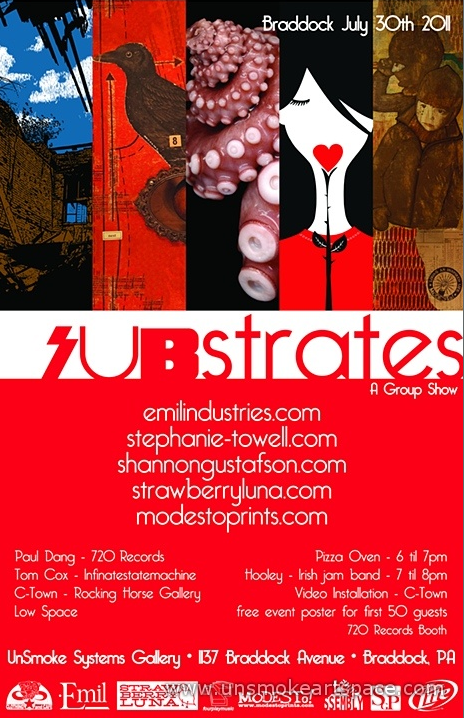 Substrates: A Group Show will show the work of 5 contemporary Pittsburgh area artist for one rockin’ night only on Saturday, July 30th. There will be a kickass outdoor pizza oven serving up fresh deliciousness and a free event poster for the first 50 guests. Come on now! Hope to see you there for this ONE NIGHT ONLY art event! 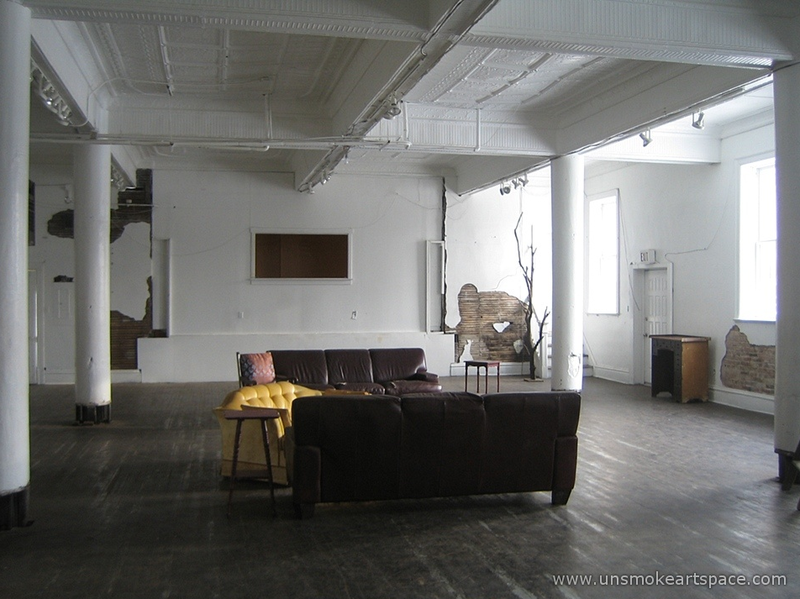 UNSMOKE Art Space, before the show. Click for more info & directions. I’m just about packed, and getting super excited to head down to SXSW in Austin, TX for the Flatstock rock poster show. I almost can’t sleep, it’s like Christmas. I figured that for anyone else thinking about checking Flatstock that I’d post a floorplan to help folks negotiate all of the awesome. It’s a bit wide, so I’ve popped it up on my Flickr page here. If you come through Flatstock, definitely come say hello!